A sheep's milk cheese from the Basque region of France. It is made in the Benedictine Monastery, Abbaye de Notre Dame de Bellocq. Red-nosed Manech sheep that are raised in this area of France provide the milk that is gathered and taken to the Abbaye for the production of this cheese. 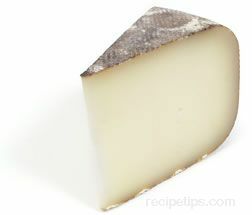 Pale yellow in color, the cheese has a firm, semi-hard texture and is covered by a thick, naturally rough rind that may be grey, ivory, tan, or dark brown in color. The cheese is quite rich with the sweet flavor of caramelized sugar that is present after it has been aged for 6 to 8 months. It is an excellent choice for hors d'oeuvres, appetizers, and grilling. It is also used in various sauces. A French cow's milk cheese with an off-white color and a savory outer layer that covers a dry and salty interior. It is cured and allowed to ripen in an unusual way: The cheese is completely covered with ashes for 30 days or more. When it is removed from the ashes, any remaining ashes are brushed from the surface of the cheese before it is served. A French sheep's milk cheese produced in various sized wheels. It has a firm, hard texture that is perfect for grating, and it has a slightly sweet and nutty flavor. The cheese is covered with a thick, yellowish rind. Ardi Gasna may be difficult to find outside of the areas of France where it is produced. A farmhouse cheese made from a combination of cow and goat milk. It is produced in the Lyonnais region of France as small rounds of cheese. It is aged in containers of the fermenting residue and skins of grapes (called marc). When the aging is complete, it is then rolled in the remaining residue before it is sold. If allowed to age longer, this moist, richly flavored cheese becomes dry and hard and has a very strong flavor. A traditional method of enhancing the appearance of cheese, to make it look distinctive or artesian crafted. The edible ash coatings are made by burning the wood of junipers, white pines, or grape vines, or the remains of vegetables, such as bell peppers and eggplants, can be used. The ash is then processed further by mashing or pounding until it becomes a fine-textured powder. Typically, goat cheeses are the most common varieties with an ash coating, containing a thin outer or inner layer of edible ash. Although other cheeses made from cows or sheep's milk may have an inner ash coating, such as Morbier or Mobay, it is the goat cheeses that are the types most often associated with an ash coating. 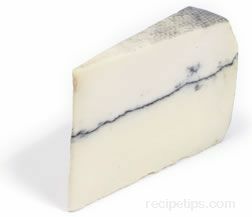 Morbier cheese contains a layer of goat's milk cheese and a layer of sheep's milk cheese separated by the layer of ash. 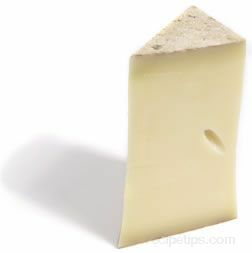 Mobay cheese, made from unpasteurized cow's milk, contains a layer of ash to separate the first and second batch of curds used in the production of the cheese. Similarly, Humbolt Fog cheese is a variety of goat's milk cheese produced with an inner layer of ash separating two layers. Goat cheeses in the form of logs, disks and cylinders with an ash coating over the outside surface include notable varieties such as Saint-Maure or Selles-Sur-Cher. A variety of white cheese that comes from the Provence region of France. It is traditionally made with pasteurized goat's milk known as Banon Chevre, but it also made with cow's milk or a blend of sheep's, cow's and goat's milk. The texture of Banon cheese ranges from soft to firm and the flavor is mild to sharp. It is sold in small rounds that are traditionally wrapped with chestnut or grape leaves to enhance the flavor of the cheese. This also helps to keep the cheese moist, which hastens the production of molds that add even more flavor as the cheese ages. As it ages, the cheese becomes creamier in texture and richer in flavor, providing a somewhat fruity tasting cheese. Banon cheese is usually served as a hors d'oeuvre or as a dessert cheese with fruit and a dessert wine. A French cheese made with cow's milk that is a pale yellow to golden yellow color with a hard texture and is produced in large wheel shapes. The natural rough textured rind is a dull burnt orange color. The flavor is very smooth. The cheese is actually a type of gruyere and it is sometimes called Gruyere de Beaufort. It is suitable for snacks, appetizers, grating, and melting. A traditional farmhouse cheese from the Pyrenees region of France that is made from cow or goat milk. The rind has an aged, leathery or biscuit-looking appearance. Beneath the rind there is a creamy ivory-colored, open-textured flesh with narrow oval-shaped holes throughout. 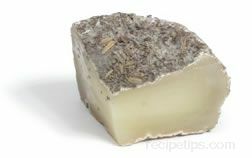 It is a mellow cheese, providing a somewhat fruity or spicy flavor with a slightly pungent aroma. With age, the cheese becomes stronger tasting and denser in texture. It is a cheese that goes well with meat and hearty breads and is also good for grilling and melting. A French goat's milk cheese made with an off-white color, soft texture, and off-white natural rind. It has a distinct herbal flavor and is usually sold in small flat rounds. It is often used as a snack or appetizer. A French cow's milk cheese with an off-white color, soft and creamy texture, and an off-white natural rind. The cheese has a high quantity of cream, which gives it a buttery, sweet, and slightly nutty flavor. As the cheese ages, it takes on the aroma of mushrooms. Boursault is sold in short cylinder shapes and is suitable as an appetizer or hors d'oeuvre. A popular French cow's milk cheese produced as a spreadable cheese in small cylindrical shapes. 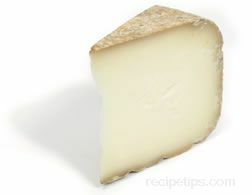 The cheese is a pale yellow to off-white in color with a texture that is crumbly, creamy, and very soft. Traditionally made as a buttery and sweet tasting cheese, Boursin is also produced with the addition of garlic or peppercorns to enhance the flavor. It is excellent as a spread for bread or crackers. It can be served as an appetizer, hors d'oeuvre, or snack and it can be use in baked recipes. Boursin cheese sauce is a common topping for beef, poultry and vegetables. The cheese can be melted in a pan containing meat drippings, which can then be combined with cream, wine, and herbs to create a savory sauce to enhance the flavor of many foods. A form or shape that is, as the name implies, twisted lengths of cheese intertwined to create a thick round braid, similar to a braided rope. This cheese, much like string cheese, is a pliable variety that can be formed into a braided shape. Common varieties that are braided include mozzarella and asadero, which is a Mexican variety. Armenian, Italian, and Syrian cheeses are also commonly produced as braided cheeses. Braided cheese can be made from raw milk or skimmed milk. It can also be made by combining sour milk with fresh milk and then produced by using the spun-curd method of cheese making in which the curd is heated at a low temperature to develop the elasticity that allows it to be twisted and formed into shapes. It is then cut into strips, braided, and salted in brine for curing. Braided cheese is produced unflavored, seasoned, marinated, and smoked. Because of its unique appearance, it is often served as an appetizer or as a stuffing for pocket breads, enchiladas, and other similar food products. A French cheese from Corsica made from sheep's milk. Produced as a small round wheel, Brebichon has the edible outer rind of Penicillium candidum that is common on the soft-ripened cheese varieties, which provides a small biscuit-like look to the unopened cheese. The cheese has a creamy texture and has a rich and somewhat nutty flavor. Unlike other soft ripened cheeses, Brebichon does not become runny in the center as it ages. 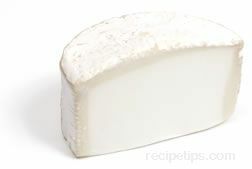 Brie is a type of French cow's milk cheese with a soft, creamy texture; a cream-white color; and a thin white edible rind. It has a taste that can be sweet and buttery or it may have a flavor similar to mushrooms. It is often used as an appetizer, hors d'oeuvre, or dessert cheese. Brie is covered with a white or blue tinted rind known as a bloomed rind that enhances the flavor to the cheese. Cheeses such as Camembert or Chèvre are bloomed-rind cheeses that have a chalky white-colored rind. 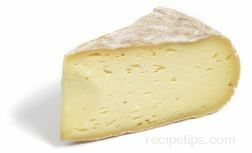 When Brie is produced, this type of rind is started by applying a white mold known as Penicillium candidum. As it ages, the mold matures or blooms, providing a semi-firm crust over the cheese while also penetrating the cheese, moving from the outer covering to the inner center of the cheese paste. As the mold grows it softens the cheese paste by breaking down the proteins contained in the cheese. If the center of the cheese is soft to the touch, the mold has penetrated throughout the cheese paste. When eating Brie cheese, enjoy the flavors that are not only within the paste but also contained in the rind. A cow's milk cheese from the Normandy region of France. It is a very rich and creamy cheese that develops a thick white crust as it ripens. It is sold in small rounds and is served as a snack, hors d'oeuvre, or appetizer. A cheese from the Corsica region of France that is made from sheep's milk. 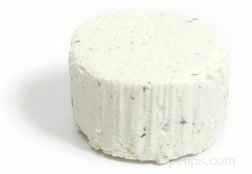 This cheese is uncooked and most often covered with herbs, which include rosemary. The outer white mold rind is rough-textured and covers a cream to gold-colored springy-textured flesh. As the cheese ages, the texture becomes denser and color becomes deeper. The cheese has a mild earthy, slightly acidic flavor that becomes sharper with age. It can be served as an appetizer and goes well with a variety of open-textured breads. A reference to numerous types of cheese that are washed with, or submerged into, a brine bath as part of the cheese making process. The cheese must remain in the brine for several hours to several months depending on the type of cheese being produced. The salty brining solution helps to limit the growth of unwanted bacteria that can produce a foul taste in the cheese (although in other stages of the cheese making process, some types of good bacteria are necessary for producing the cheese). The brining solution provides cheese with a slightly salty, savory flavor that is quite desirable in many types of cheese. A goat's milk cheese native to France, which is similar and synonymous with French chevre. Bucheron is ripened for five to ten weeks and is produced in short logs that are sliced and sold as small rounds in food stores. When young, this semi-firm cheese has a somewhat mild flavor, but it becomes sharper as it matures. It is a good cheese for salads or for snacking and is excellent when served with grapes, crackers, or hearty whole-grained breads. A French cheese made with cow's milk in which extra cream is added before the milk coagulates. The extra cream gives the cheese a rich, smooth texture. The flavor of the cheese is slightly salty with a hint of bitterness. If the cheese is allowed to ripen for a longer period, the flavor becomes much sharper. The yellowish-white cheese is sold in small puffy blocks and it is generally used as a table cheese.